Yeah yeah, you guys know the drill by now. These pictures were taken last week. The front of the bun looks pretty good still. The white mold at the back is slowly growing! Supersize My Blueberry Loaf: Not even a month!! As you might recall, this was the blueberry loaf acquired December 10th and what it looked like then. Two different molds are present, most of them look like they sprung from the blueberries. I have no idea when they started growing, but from the size of them, I’d say at least a week ago. This sucky Blueberry Loaf didn’t even last a month! Why such a disappointing performance? Compared to the other two Supersize Me experiments (September’s pineapple bun, November’s croissant), this had the most simple home-made ingredients (white sugar, white flour, eggs, orange juice, milk, baking powder). No preservatives, and from that ingredients list 0 trans fat. Thus making it your healthiest (though probably least delicious) choice! It was so gross I wondered why I got myself into this mess. (scientific curiousity.) The light green mold covered the back, which I was too grossed out to photograph because I was in too big of a hurry to rid my desk of this. I had to put on my gloves, take it out without breathing, wrap it up in saran, and chuck it in the biohazardous waste in the lab. Endurance: Less than 30 days. Updates on the Pineapple bun and the Criossant to follow! Stay tuned! This morning the robot at work did something very freaky (things were broken, water was everywhere) while N was using it (L said this might just be the day that our robot gained its own intelligence and betrayed its masters). N wondered why she is always so unlucky with the robot, and I said it was because she really needs to wear lucky underwear on days of crucial experiments (I do, because screw ups are a given when you do important experiments). Poor thing. So then, as I was getting my coffee, I got her a piece of this pretty looking Cranberry Bliss cake and brought it back to the lab – it had a layer of white icing decorated with red cranberries on the top, so Christmas-y :-). She offered me some, but T said not to because it will just end up in a jar on my desk. OK, OK! I promise I will stop before my desk at work is overwhelmed with my Supersize Me experiments. No food or drinks allowed in the laboratory, afterall. But you know me, I just can’t resist temptations of the nerdy nature. And if people keep bringing in “interesting” food specimens (I don’t see why they would stop) to feed the pack during lab meetings, I might just get into some trouble here (and having all the evidence splattered over my blog). Nevertheless! Until then, we are all for the (criminal) pursuit and satisfication of scientific curiosity, are we not? The general impression was that this cake was really not the greatest (“way too doughy”, “not good at all!”, chucked after one bite, etc). Perhaps adding butter to the ingredients might have helped (and did anybody notice that while it is a “Blueberry Loaf“, and very obviously contain blueberries, that “blueberries” did not actually appear in the ingredients list?? So what are those dark blue purply things?? :-P). Nonetheless, I was quite happy to see that it did have enough fat (would have to be in the eggs alone) to leave quite the grease mark on the paper towel it sat on for about 10 minutes. Otherwise, with such … modest ingredients I am guessing this will mold pretty soon. Maybe in a week or two. I’ve decided to start another Supersize Me experiment in the lab, this time with a croissant from Safeway. Before you condemn me for wasting food for the sake of my scientific endeavors, let me just say that this poor croissant was left over from a meeting on Monday, then sat in an open box in the computer room where nobody touched it for several days, next to some left over rotting fruit that started attracting a massive buzz of Drosphila of a neighbouring lab. It then turned into a piece of hard, inedible flaky rock (still very greasy to the touch). I felt compelled to rescue it. 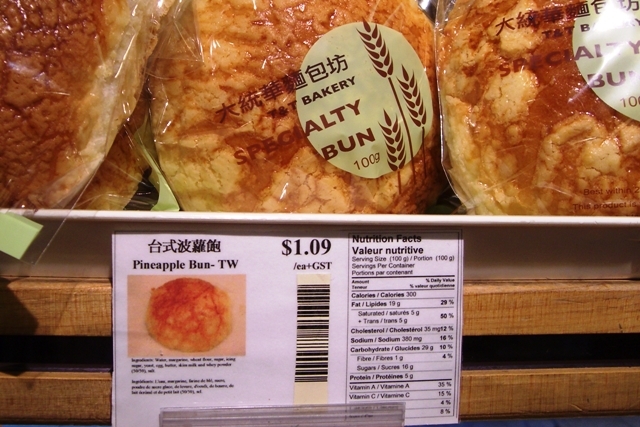 If you remember, a typical HK-style pineapple bun has 3.5g trans fat per 100g of bun, which is 3.5%. The croissant has 4g of trans fat per 64g of croissant, which equals 6.25%, nearly twice that of the pineapple bun. Seeing that our Supersize Me pineapple bun is still doing good at 10 weeks, I’m sure that doubling the trans fats will carry this croissant pretty far. We’ll see! So here it is, it doens’t look a day over …er, I dunno, a day? 😉 Considering this is what it looked like last month, I’d say it’s doing pretty good! We get a lot of molds growing on plates in the lab. I think the mold might have got in and started growing on the bun from that time we opened the box to smell it (which was Oct 17). The fact that the bun itself hasn’t start to lose its shape or change color is still pretty impressive though. Never in my pineapple bun-loving life have I ever eaten a 菠蘿包 (pineapple bun) that came with nutritional information or a list of ingredients. I have always been curious though. Of course, Chinese bakeries are not known for their attention to nutrition, and if you are eating a pineapple bun, you know you are definitely not doing something good for your heart. Now, I know pineapple buns are made with a lot of lard and sugar, that’s why they taste so damn good. Water, sugar, wheat flour, margarine, yeast, pure lard, skim milk and whey powder, egg, evaporated milk, egg yolks, salt, baking soda, vanilla concentrate. No doubt, every bakery have their own secret pineapple bun recipe, but lard and sugar – almost always two musts. 340 calories, 16g of fat, 3.5g trans fat, 21g sugar. 340 calories, 18g of fat, 4.5g trans fat, 7g sugar. 320 calories, 19g of fat, 0.1g trans fat, 22g sugar. 350 calories, 18g of fat, 2g trans fat, 0 sugar. Doesn’t it seem like the pineapple bun’s got the worst of both worlds here? We’re talking about the double whammy here- I couldn’t find anything with a comparable caloric value that has similarly high levels of both trans fat and sugar as the pineapple bun. And considering the data, if you were gonna blow 300-odd calories, those fries are surely a “healthier” choice compared to any commercially baked good, no? Nevertheless, I may not eat McD’s fries, but you sure as hell can’t stop me from eating pineapple buns! 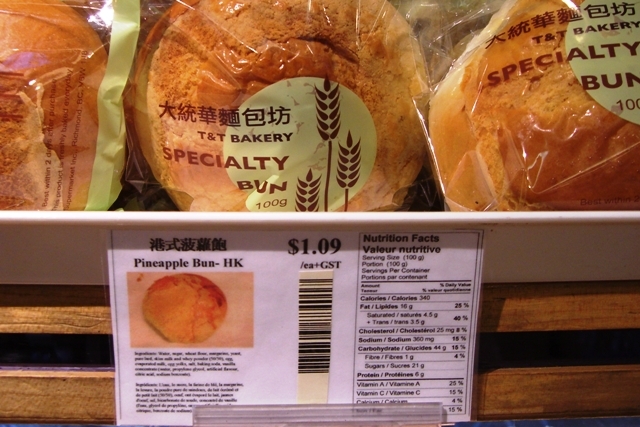 And a seemingly simple ingredients list doesn’t necessarily mean it’s any less evil: They also had a Taiwanese-style pineapple bun (looks nothing like a pineapple bun to me), that had 5g of trans fat, and it doesn’t even have lard in it! OH! Evil margarine! Water, margarine, wheat flour, sugar, icing sugar, yeast, egg, butter, skim milk and whey powder, salt. Addendum: After smelling the half-bun and writing this post, I opened the Glad box and took a sniff. It still smells great. Like a fresh pineapple bun the day it was bought (ie. sweet and baked-goods-smelling). Scary!